Getting Beat by Athletes Who Don’t Train As Much? Now, you can improve your mental toughness with the leader in online sports psychology programs, Dr. Patrick Cohn. And you don’t have to attend any sports “boot camps”; in fact, you don’t even need to leave your home because Dr. Cohn’s programs are available online! With just a modest yearly fee, coaches and athletes can now have unlimited access to confidence-boosting tips from this highly-regarded leader in online mental training programs. Dr. Cohn’s program is ideal where ongoing, self-paced learning is desired to improve individual or team mental toughness. Participating athletes and coaches will get new content each month, with the newest methodology in online sports psychology and mental training strategies. With just a mouse-click, a little time, and a little note-taking, coaches can keep their team on the cutting-edge with the fresh monthly content they can share with their players. You can access online sports psychology articles, interviews, and classes NOT available anywhere else on the web. 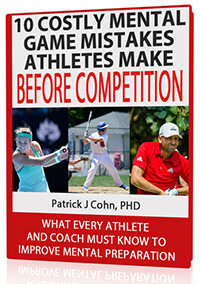 You will learn from our sports psychology experts and pro athletes who use mental game strategies to win. You will have access to online mental training classes and pay one fee for the entire year. You will get new mental game content each month based on challenges athletes face today. For older competitive athletes ages 15 years and up and high school and collegiate sports coaches, you’ll learn how to improve confidence, composure, and overall mental toughness with our exclusive online mental training program. You can learn the same cutting-edge mental training strategies used by the pros to perform with consistency. And all for one low yearly fee! Receive a sample mental training teleclass from Peaksports network. Get a free mental training video with Ken Ravizza, a mentor of Dr. Cohn’s. Access a free sample mental training article from Peaksports Network. Get free mental training tips delivered to your inbox.